So don't be a scaredy-cat! The absolute worst thing that will happen is that you might have to refresh this page in your web browser if you get stuck. Don't worry though, this will happen very rarely. This is a console, otherwise known as a "command line" or "terminal". Basically it's a way to type one thing at a time into a computer and immediately get the computers answer back. 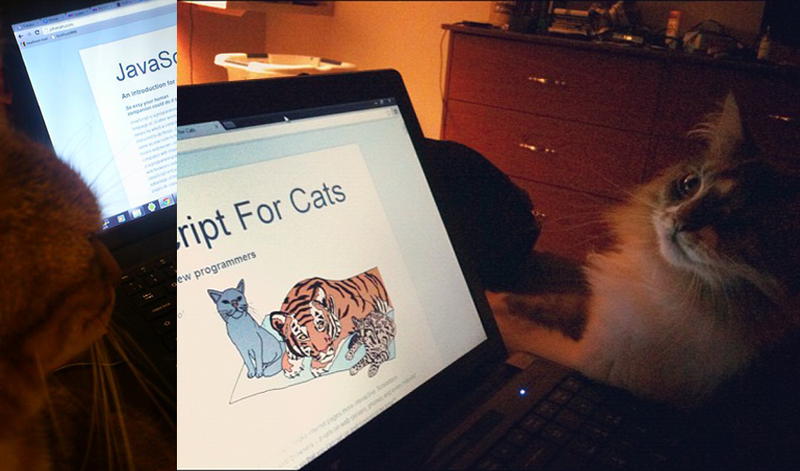 They are super useful as a learning tool (I still use the console nearly every day that I'm coding). The console does some pretty cool stuff. Here I have started to type something and the console is helping me out by giving me a list of all the possible things I could continue to type! Another thing you could do is type 1 + 1 into the console and then hit the Enter key and watch what happens. See the nasty error message? Don't worry - you didn't break any laws. SyntaxError ILLEGAL is just the way it sounds when robots tell you that your program has a problem. The first two sentences had matching quotation marks at the beginning and end, but when I mixed single and double quotation marks it freaked out on me. OK, to fix up one of these sentences (by replacing dog with our enhanced version) we have to first save the original sentence so that we can call it up later when we do our replacing magic. Notice how the string gets repeated in red when we type it into the console? This is because we haven't told it to save the sentence anywhere so it just gives it right back (or it gives us an Error back if we messed something up). var is shorthand for variable and the = means store the thing on the right-hand side in the thing on the left-hand side. Also as you can see, now that we are storing our sentence in a variable the console doesn't just return our sentence right away, but instead gives us undefined which means there was nothing to return. If you simply type a variable name into the console it will print out the value stored in that variable. A note about variables is that by default they go away when you switch to a different page. If I were to hit the Refresh button in Chrome, for example, my dogSentence variable would get wiped and it would be like it never existed. But don't worry about this too much for now — you can just hit the up or down arrows on your keyboard while in the console to go through everything you've entered in recently. Now that we have our sentence stored in a variable, let's change a word stored in it! We can do this by performing a function. Functions are a type of value that, well, serve a specific function (AKA purpose or action) for us. Calling them "actions" sounded weird I guess so they went with the word "function" instead. You aren't limited to using other peoples functions — you can also write them yourself. It's pretty easy! Let's make a function called makeMoreExciting that adds a bunch of exclamation points to the end of a string. The expression string + '!!!!' returns a new string and our variable called string stays the same as before (since we never updated it to anything else with =). var sentence = "time for a nap"
Now sentence will have the exclamation marks in it! Note that you only have to use var when you are initializing a variable — the first time you ever use it. After that you shouldn't use var unless you want to re-initialize (reset/clear/empty) the variable. What would happen if we took out the return statement in our function? This function, yellIt, uses our previous function makeMoreExciting as well as the built-in String method toUpperCase. 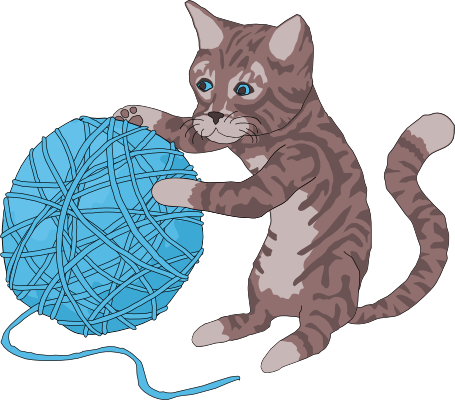 Methods are just a name for a function when it belongs to something — in this case toUpperCase is a function that belongs to String so we can refer to it as either a method or a function. makeMoreExciting on the other hand doesn't belong to anyone so it would be technically incorrect to refer to it as a method (confusing, I know). The last line of the function is another built-in that simply takes in any values that you give it and prints them out into the console. This way yellIt becomes more generic, meaning it only does one or two simple little things and doesn't know anything about printing itself to a console — that part can always be programmed later, outside the function definition. 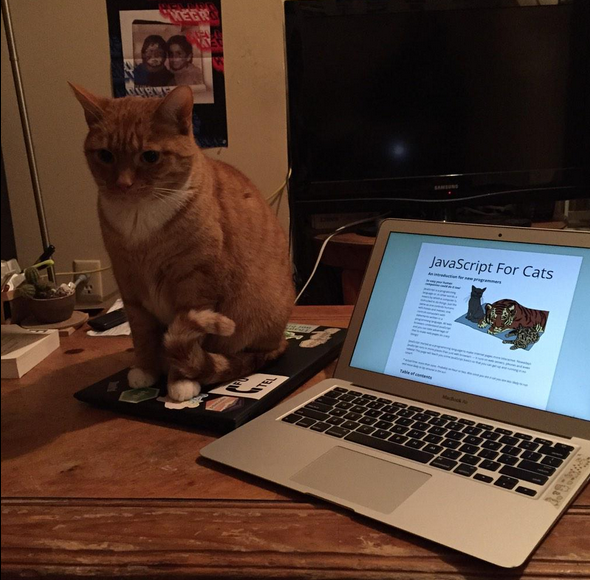 Now that we have some basic skills under our belt (Author's note: do cats even wear belts?) we can start being lazy. What?! Yes, that's right: programming is about being lazy. Larry Wall, inventor of the Perl programming language, called laziness the most important virtue of a good programmer. If computers didn't exist you would have to do all sorts of tedious tasks by hand, but if you learn to program you can lay in the sun all day while a computer somewhere runs your programs for you. It is a glorious lifestyle filled with relaxation! This code uses the times method of Underscore which takes in 1 number and 1 function and then starts from 0 and for 10 steps counts up by 1, calling the function with the number each step of the way. But cats refuse to do unnecessary manual work like this so we must always ask ourselves, "am I doing this in the laziest way possible?". 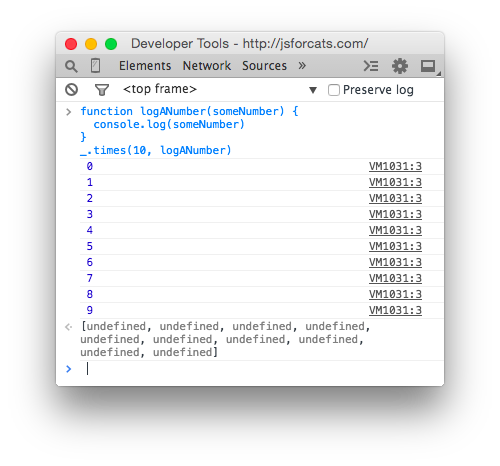 What times really does is visit each number and repeat a task: in the example above the task was to call the logANumber function with the current number. Repeating tasks in this way is referred to as looping over the Array. I've mentioned these a few times but let's spend a minute learning about them. Imagine you need to keep track of all your buddies. Well, an Array will do just fine. Think of an Array like a sorted list that you can keep tons of stuff in. Sweet! 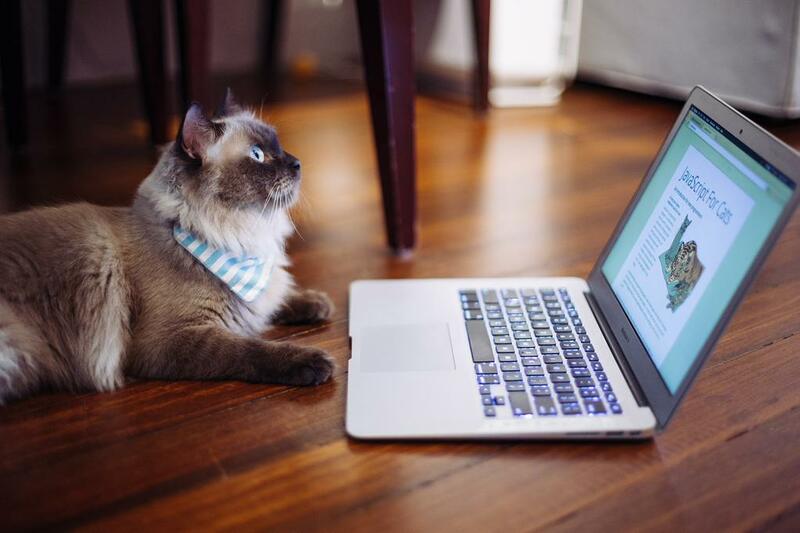 Now you have a list of your cat buddies. Elements (that is what you call a single item in an array) that are stored within arrays start at 0 and count up from there. So myCatFriends returns bill and myCatFriends returns tabby... etc etc. If you made a brand new cat friend at the hippest cat club the other night and you want to add them to your list it is super simple: myCatFriends.push("super hip cat"). Arrays are good for lists, but for other tasks they can be hard to work with. 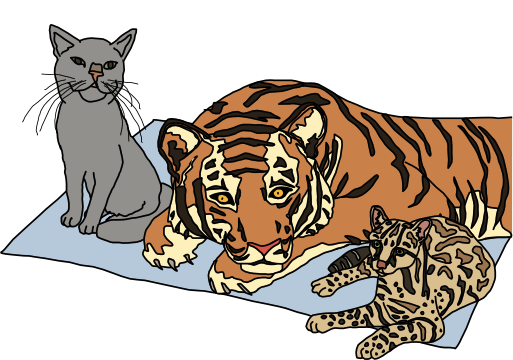 Consider our array of cat friends. What if you also wanted to store more than just names? Sometimes it is nice to have all of the addresses or names in one variable. But sometimes you have a cat in mind, let's say Bill, and you just want to look up that cat's address. With arrays it takes a lot of work because you can't just say 'hey array, give me Bill's address' because 'Bill' is in one array and his address is in a totally different array. Why would we do it this way? 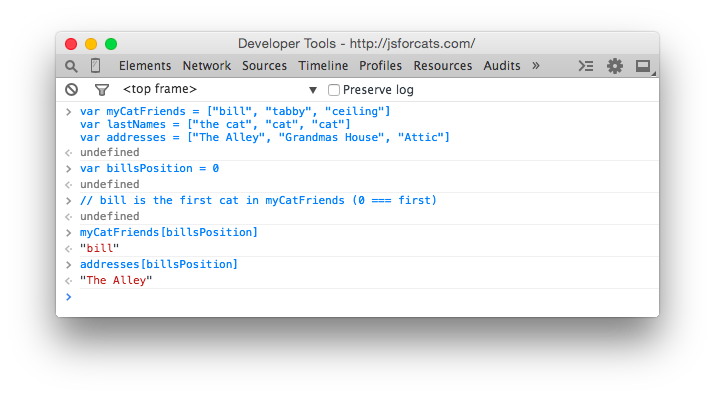 Because now we have a variable for each cat that we can use to get that cats values in a more convenient and readable way. You can think of Objects like keys on a keyring. Each one is for a specific door and if you have nice labels on your keys you can open doors very fast. In fact, the things on the left hand side of the : are called keys (are also known as properties) and the things on the right hand side are values. So you can't ever trust the order of keys in objects. If you wanna get REALLY fancy you can make an array filled with objects, or an object filled with arrays! When you combine different things like this you are making data structures, just like legos! 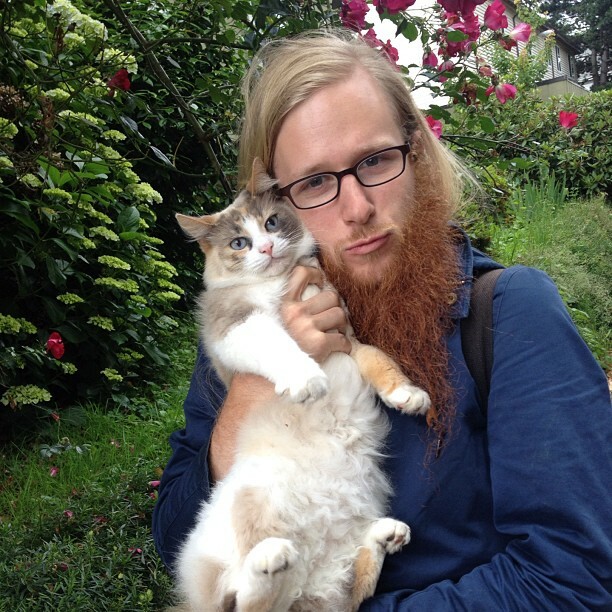 This synchronous pseudo-code downloads an adorable cat photo and then uploads the photo to twitter and tweets the photo at @maxogden. Pretty straightforward! Some languages have a function called sleep that blocks execution for some number of seconds. For example here is some bash code running in Terminal.app on Mac OS that uses sleep. When you run the command sleep 3 && echo 'done sleeping now' it blocks for 3 seconds before printing out done sleeping now. In the non-blocking version b is a callback to a. In the blocking version a and b are both called/invoked (they both have () after them which executes the functions immediately). In the non-blocking version you will notice that only a gets invoked, and b is simply passed in to a as an argument. In the blocking version, there is no explicit relationship between a and b. In the non-blocking version it becomes a's job to do what it needs to do and then call b when it is done. Using functions in this way is called callbacks because your callback function, in this case b, gets called later on when a is all done. Think back to our non-blocking example, a(b), where we call a and pass in b as the first argument. In the function definition for a above the done argument is our b function that we pass in. This behavior is something that is hard to wrap your head around at first. When you call a function, the arguments you pass in won't have the same variable names when they are in the function. In this case what we call b is called done inside the function. But b and done are just variable names that point to the same underlying function. Usually callback functions are labelled something like done or callback to make it clear that they are functions that should be called when the current function is done. To drive the point home even further: If a takes one second to complete, and you use the blocking version, it means you can only do one thing. If you use the non-blocking version (aka use callbacks) you can do literally millions of other things in that same second, which means you can finish your work millions of times faster and sleep the rest of the day. Remember: programming is all about laziness and you should be the one sleeping, not your computer. I'd recommend coming back again tomorrow and going through the entire thing again from the beginning! It might take a few times through before you get everything (programming is hard). Just try to avoid reading this page in any rooms that contain shiny objects . . . they can be incredibly distracting. Got another topic you wanna see covered? Open an issue for it on github. NodeSchool.io is a community driven, open source educational software that teaches various web development skills in an interactive, self-guided format. I helped make NodeSchool! 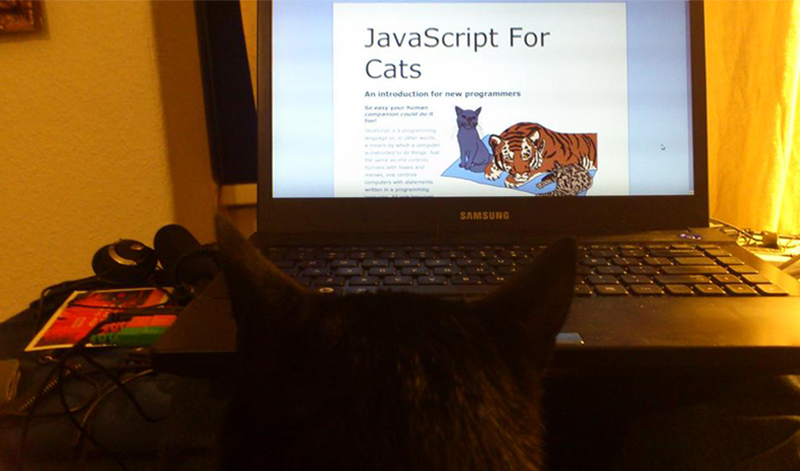 Sadly it features fewer cats than this page. 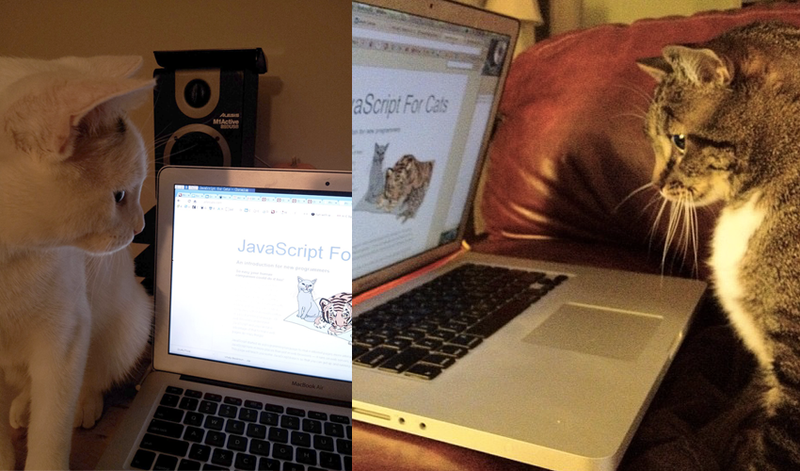 JSForCats.com is a labor of love and work in progress by @maxogden. If you would like to contribute and make this tutorial better there is a Github repo right over here.